This small and intimate 24-unit resort is ideal for reunions, meetings, parties or group tours. The resort focuses on smaller retreats (up to 40 people). Catering is available, or you are welcome to bring your own meals. 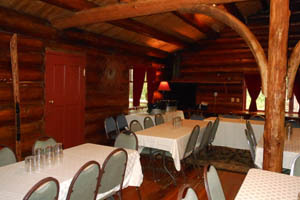 The log recreation lodge can accommodate 35-40 people theater style or 30-35 people classroom style. A full range of audio visual equipment is available. The 1920’s lodge lends itself to casual gatherings and the quiet calm of the surrounding natural setting helps everyone “get away from it all.” Alta Crystal Resort is the only lodging in this area with both a hot tub and year-round heated pool — plus it has a recreation field, perfect for group gatherings. Crystal Mountain Hotels specializes in all-inclusive group events for small to medium sized parties (20-100 people). Dining and lodging facilities for the group are located at the base of Crystal Mountain. Crystal Hotels has experience with the full range of group sizes, hosting sales meetings, running camps, family reunions, company holiday parties and cycling camps. Lodging is available for conferences, reunions, car shows, sporting events, retreats and more. The outdoor heated pool, communal barbeque area, kids playground, picnic area, and outdoor fire pit offer a variety of activities for everyone. Each unit is equipped with their own kitchen and various catering options are available. Crystal Chalets offers vacation rentals condominiums on a hillside overlooking Crystal Mountain Resort. There are a couple of other vacation rental options as well. From school groups to corporate retreats, and ages 12 to 112, Crystal Mountain Resort is a great option for groups. Private space, catering and box lunches are available and will be customized to fit your needs within a week’s notice. Crystal Mountain will tailor fit a trip to accommodate your tour group. Group rates start at 15 people. The entrance fee for a private, non-commercial vehicle with a seating capacity of 15 or less is $25. These fees provide the visitor with a 7-day entrance permit for Mount Rainier National Park. For commercial vehicle fees, click here. Note that certain educational groups may be eligible for a fee waiver.